Ron Vlaar, meanwhile, has been offered a contract extension. Stevens made just nine appearances for the club. ENDA STEVENS’ DISAPPOINTING three-year stay at Aston Villa has come to an end with the Premier League club confirming the Irish defender has been released. Stevens, an Irish U21 international, failed to make an impression during his time at Villa Park after moving from Shamrock Rovers in January 2012. 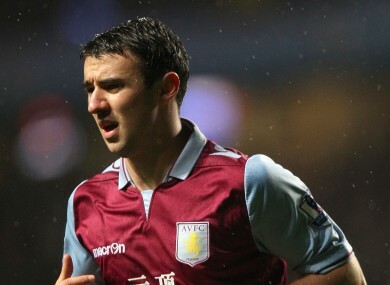 After spending the first few months in the Villa reserve team, Stevens was drafted in to make his full debut against Manchester United in November 2012 due to injuries and suspensions. He made just nine appearances for the club having been shipped out on loan to various lower league sides throughout his time at Villa. The 24-year-old spent the second-half of last season with Doncaster Rovers where he made 28 appearances for the League One outfit, scoring once. He also had spells with Notts County and Northampton Town. Stevens spent two seasons at Rovers after progressing through the ranks at UCD and then impressing for St Patrick’s Athletic. He was part of the Hoops side that became the first Irish team to qualify for the group stages of the Europa League. Stevens isn’t the only Irish player to be leaving Aston Villa with Dubliner Graham Burke failing to earn a contract extension. Burke made his senior debut for the club in August 2012 during a League Cup tie against Tranmere Rovers but, like Stevens, was unable to kick-on. England international Darren Bent has also been released but club captain Ron Vlaar has been offered a new contract at Villa Park. Email “Aston Villa have released two Irish players as part of their summer clear out ”. Feedback on “Aston Villa have released two Irish players as part of their summer clear out ”.